If a band finds a certain level of success in what they’re doing does that automatically make them “sell-outs?” Case in point, AFI has recently enjoyed #1 status on the charts with their new record Decemberunderground. 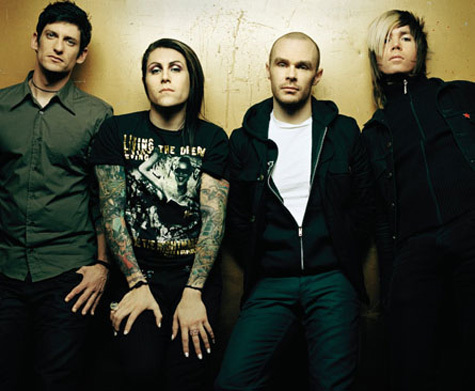 A lot of people have come out of the independent woodwork to slam this band with all sorts of labels including the dreaded “sell-out,” but AFI has more than a decade of van tours, seven full-length releases (five of which are released on independent labels). I prefer to think the best in people and want to give AFI the benefit of the doubt, so I went to see for myself if AFI were still the same band from my youth. When I arrived at the fairgrounds, the Warped Tour style line was not very encouraging, but it moved fast and soon I was in. Dillinger Escape Plan was about ready to go on. They hit the stage and proceeded to sonically attack the unsuspecting audience for about 40 minutes. I found this band live boring and repetitive. They’re masterfully crafted records just make impossible for this band to put they’re highly technical music across, and nuances of what they were attempting certainly fell on the unappreciative ears of Hot Topic regulars that made most of audience. It’s easy to tell when they’re all wearing the same 4 or 5 shirts. Finally, to the elation of every teenage girl there, AFI hit the stage in the usual dramatic flair that they bring to every performance. Everything on stage draped in an eerie white, including the band and each of their instruments. After the intro off of the new record (I miss chanting “through our bleeding we our one”), the band glided through hits of more recent records, only pausing to remark that this was the largest crowd they had played to in Salt Lake. As their set went, Davey Havok’s vocals seemed to hit the mark easier and the band fell into line. They pulled songs form their latest releases, and didn’t delve into anything older than Black Sails at Sunset (1998). Then Davey dropped the bomb. He announced that the next song would be “A Single Second,” and that Nick 13 of Tiger Army would be joining in on vocals. My favorite AFI song with a special guest I am a fan of. The dual vocalists ripped through the most abrasive song of the night, and the show hit its high point. They finished the set with the radio hit “Miss Murder,” which finally satisfied the younger and lamer populations in the audience. After was all said and done, AFI is just a band that has grown into its talent. The Clash did the same thing by not just being a punk band, but using punk as the platform to experiment and test the waters for everything else. They’re not letting genre or preconceived ideas of what their music should be get in the way of were the music naturally takes them, but like I said I prefer to think the best of people.